Currents, orange, ginger, vanilla & walnuts make these such a delicious and healthful cookie. I was very excited about how these cookies came together. The ingredients are so delicious and with the tablespoon of fresh ginger, you get a nice little spicy bite. I used brown rice syrup to sweeten and hold the ingredients together. Brown Rice Syrup is made by fermenting brown rice with special enzymes that break down the natural starch content of the rice. This process produces a translucent syrup that's an excellent alternative to white and brown sugar. 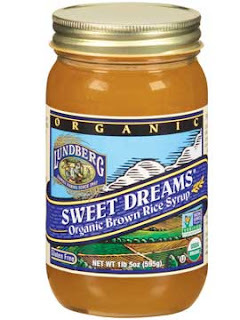 Unlike simple sugars, such as monosaccharides and disaccharides, Brown Rice Syrup is a polysaccharide, or a complex sugar. The unique structure of complex sugars allows them to be absorbed and broken down more slowly than simple sugars, avoiding rapid spikes in blood glucose. Slower absorption also allows the body to utilize complex sugars for energy instead of having to store them as fat for later use. 1.) Preheat oven to 350F. Line baking sheet with parchment paper or lightly brush with oil. 2.) In a bowl mix all dry ingredients together. 3.) In another bowl mix all wet ingredients and wisk until smooth. 4.) Combine dry and wet ingredients. 5.) Place heaping Tbsp. of cookie dough on baking sheet spaced an inch apart. Flatten cookie with a glass dipped in flour to prevent sticking. 6.) Bake cookies for 15 minutes or until lightly golden brown around edges. I love brown rice syrup! And I get that exact brand! The cookies look scrumptious!!! I can't seem to find brown rice syrup - I thought Whole Foods would have it... This recipe looks fantastic. Heather, I purchased my brown rice syrup at Whole foods. You can purchase it from iherb.com for much less than what I paid at Whole Foods though.I added the link to my post when you click on brown rice syrup. Sounds like a delicious combination of flavors! Debbie-I left something at my blog for you! These look great! Will have to give them a try! Shen, you are so funny. I bought the currents at Whole Foods in the bins.